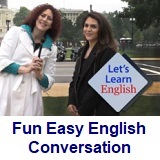 ﻿ Fun Easy English - new american english standard conversation Voice of America VOA learning English for beginners lesson 31 Take Me Out to the Ball Game discourse. In this lesson Anna wants to go to see a baseball game. The question is: what is the fastest way for her to get there? Her friends Jonathan and Ashley give her advice. Anna: Hi, there, sports fans! Baseball is America’s sport. Today, I am going to Nationals Park. It is home to Washington, D.C.’s baseball team -- the Washington Nationals! Jonathan: Hi, Anna! Where are you going? Anna: I am taking a bus to a Nationals baseball game! Jonathan: Don’t take the bus. A taxi is faster than a bus. Anna: Oh, good idea. You know I love baseball. Jonathan: That’s great. Have fun. Anna: In fact, I wanted to be a baseball player. Jonathan: Is this one of your memories? I’m really busy. Anna: This won’t take long. I can see it now... I am at home plate. I wait for the pitch. The ball comes. I swing. It’s a hit! I run to first base, second base, third base, then home plate. It’s a home run! The crowd cheers! Woo hoo! Jonathan: You really love baseball. Have fun at the game, Anna. Ashley: Hi, Anna. Where are you going? Anna: Hi, Ashley. I am going to see a Nationals baseball game! Ashley: What time is the game? Ashley: Do you have a ticket? Ashley: Anna, you should go a lot earlier than 7 o’clock. Anna: That is why I’m taking a taxi. Taxi! Ashley: Anna, Anna, that’s not a good idea. A bicycle is faster than a taxi. Anna: Oh, Ashley. Ashley, Ashley, Ashley. A car is faster than your bicycle. Ashley: In D.C. traffic sometimes a bicycle is faster than a car. And right now, there is a lot of traffic. Anna: Good point. But I don’t have a bicycle. Ashley: Okay, Anna, you can use my bicycle. Anna: Thanks! I really want to learn how to ride one. Ashley: What do you mean, learn how to ride a bike? Oh, Anna! Anna, Anna! Ashley: You know, Anna, the Metro is faster than a taxi and a bicycle. You ought to take the Metro. It’s that way. Anna: The Metro was a lot faster than a bus, taxi or bike. And now I’m at Nationals Park! Look at all these fans! So many people like to watch baseball. There’s the ticket window. What? The tickets are sold out? Nooooooo!Nooooooo! But I really want to watch a baseball game. Does anyone have an extra ticket? Fan: Next time, you should buy your ticket online. In this video, learn to say the new words for this lesson. 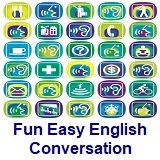 You can also learn about ​comparative adjectives like "faster," and superlative adjectives like "fastest." Use this video to learn about pronouncing "than" in sentences with comparative adjectives. Do you like to watch sports? Where do you watch them? Write to tell us about a game you saw. 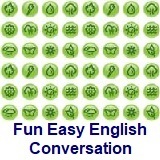 Try to use some of the words from this lesson, like ticket, crowd, fans, and cheer. Write about it in the Facebook Comments section below. 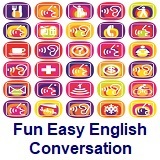 Then practice using comparative and superlative adjectives with a friend. Click lesson activity to get the printable PDF version. The page opens to a new window.